If you came here to see our pet rooster, please head directly to Meet Our Pet Rooster. EcoSport DIY Series features tutorials on various EcoSport-related topics, ranging from routine maintenance procedures to advanced DIY modifications. We also post about our road trips and other things that may be useful to fellow EcoSport owners and enthusiasts. On December 24, 2016, we went to the dealership to finally purchase our first car just in time for Christmas: a black 2017 Ford EcoSport (Trend MT). While access to the website is free, email subscription is required to access the password-protected pages. Awesome vids! 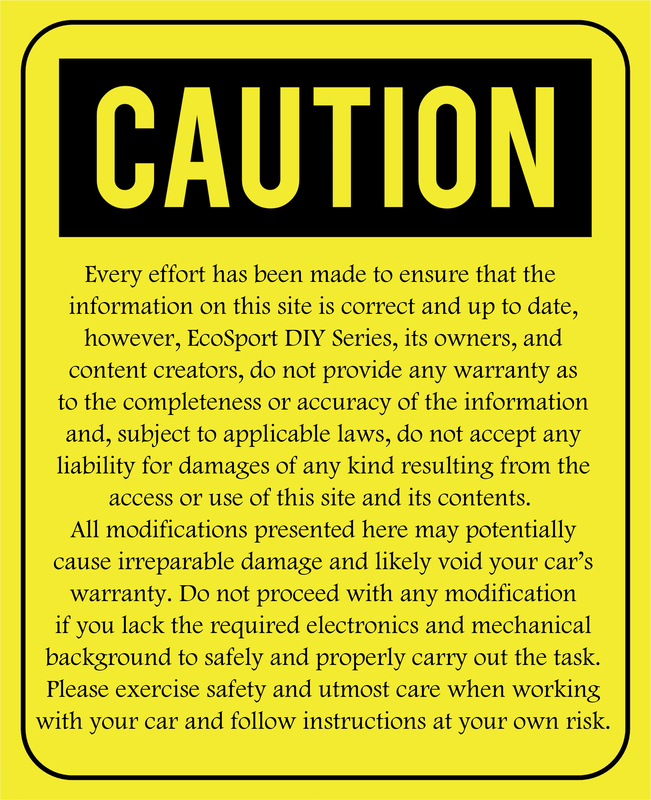 Very helpful and I’ve learned a lot of things regarding doing some DIY stuff for our beloved Ecosport. Here’s to more DIY and helpful hints! Boss san mkita DIY videos mo? Nice reference to explore and understand our eco more! Kudos! Ecosport owner also. Your vlog is very much helpful to us Ecosport fans! Keep it up and more DIY series’s to come! Such a great help in times you were not able to give time to look up in your manual…reliable,fast and easy in a way you know where to go and find an advice or solution in case of worry or need something to fix. Grateful to have this kind of diy series by sir anthony. Kudos and Godbless!!! Sobrang malaking tulong sa car community ng mga gawa nyo hindi lang po sa Ecosport. Pwede ba ako mag request ng DIY about Horn installation like Bosch Europa, balak ko kasi iDIY nalang pagkabit ng nabili ko na busina. Salamat po and more power! Many thanks sir, your site helps a lot of ecosport owners and enthusiasts, give the world the best you xan and the rest will come back to you! Very informative and a great help to all ecosport owners and would be owners, keep it up! Awesome work. Hope to see more of these. Thank you very much! Thanks bro. Abangan ko yan, You help us saving a lot of money. Thank you so much! pano po ilabas na naka max ung tachometer and speedometer na naka stationary lang? Kindly look for the entry about hidden features (you need to subscribe to view the video). The photo shows the EcoSport in diagnostic mode. Fantastic blog! I just moded the key to open the boot! Awesome hack!!! thanks for the steadfast assistance and valuable tutorials in this blog. Keep it up! dami kong natutunan dito. for a beginner sa kotse na gaya ko this is an ultimate guide para sa first car ko. salamat sir! keep it up! BIG Thumbs up for you sir ! Thanks po for creating this page po.,i learned a lot just by reading their comments😊.,big help to us lalo sa mga baguhan na driver like me..God bless po Sir Anthony! i am trying to view you DIY vids, i think i subscribe but i didn’t get a password po. Kudos kay Sir Anthony at sa mga helpful tips, advise and tutorials and “how to’s” and “DIY’s” helpful po lalo na sa mga wala masyadong idea kung papaano aalgaan ng maayos ang ating sasakyan. many thanks to sir anthony. a lot of effort’s para sa minamahal na ecosport & huge help para saten mga eco owner’s, specially samen mga ofw while where out of the country may natutunan kami, just watching the videos then applied when were home. keep it up boss stay safe godbless. Sir, Thanks sa mga tips & tutorials, sobra laki tulong. Request po sana, if may mga tutorials for Titanium model. Thanks. More Power! Very informative and helpful itong ecosportdiyseries na gawa nyo sir sa kagaya Kong ecosport owner. Maraming salamat and God bless you more. great help! Keep it up sir!